This class is for the intermediate to advanced student who wishes to explore new techniques and keep enhancing their skill level. 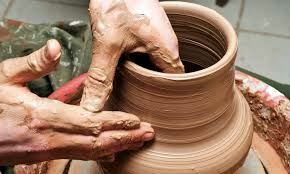 Weekly topics may include advanced techniques in; throwing larger forms, repeat throwing, bottle forms, incorporating hand building into your wheel thrown forms, handles and lids, surface decoration, glaze techniques, tool making and more. Demonstrations are presented in a 60-minute workshop format, alternating with open work evenings where individual assistance is available. Fee includes up to 25 lbs. of clay, glazes & firing.